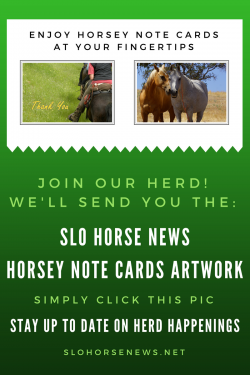 Do you love horses, great food and a worthy cause? 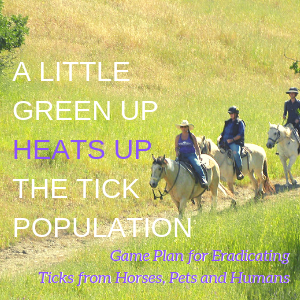 You can enjoy all three of these favorite things at Redwings Farm-to-Table event at a private ranch in Castle Rock, Markham Ranch territory in Steinbeck country near Salinas on September 29, 2018 11:00 am – 1:00 pm. 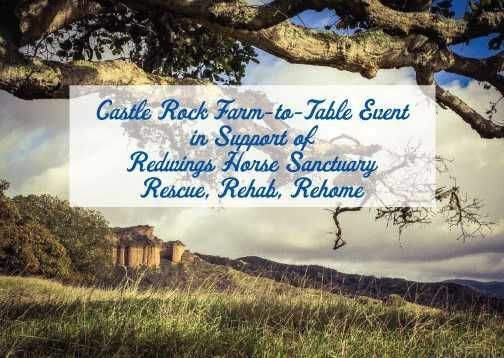 The purpose of the lunch is to enjoy a gourmet meal, socialize with other horse lovers, and raise support for Redwings Horse Sanctuary’s efforts to rescue and rehome abused and neglected horses. Luncheon guests will be treated to a delicious farm-to-table meal, with local produce provided by Patrick De Young, and underwritten by the event hosts, Joan and Terry McHenry. 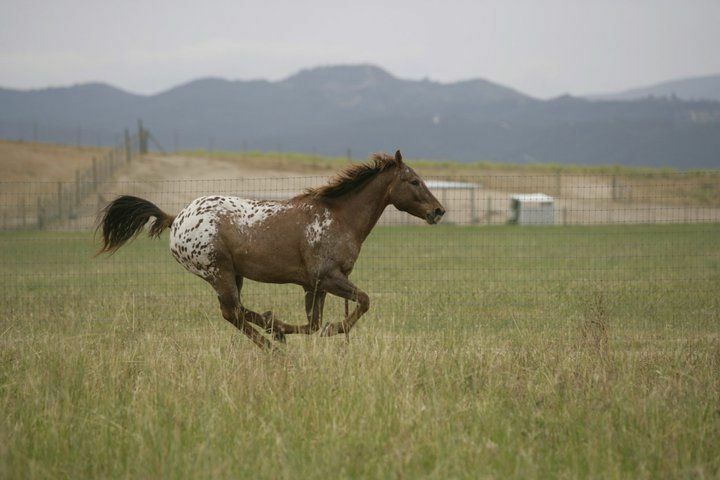 “The hosts, who have permanently fostered a Redwings pony and burro, have generously offered their beautiful private ranch in Castle Rock, Markham Ranch territory near Salinas for the event to give back to our non-profit. This is our second year hosting the luncheon at their home,” remarks Desirae. Redwings staff and volunteers, including Executive Director Andie Wilcox and Equine Care Supervisor Sara Ruggerone, will be greeting and serving guests. A presentation about the on-going work of Redwings will take place during lunch. “We will speak about our Foster to Adopt program. 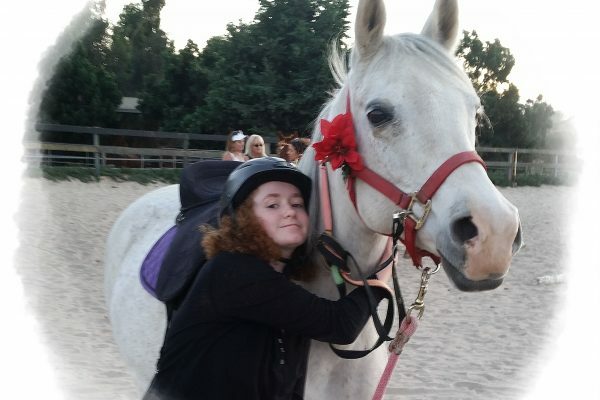 We have successfully rehomed eight horses since January. Our one-year foster period enables Redwings staff to keep a close eye on the foster horse and make sure they are happy, healthy, and a good fit for the foster family. 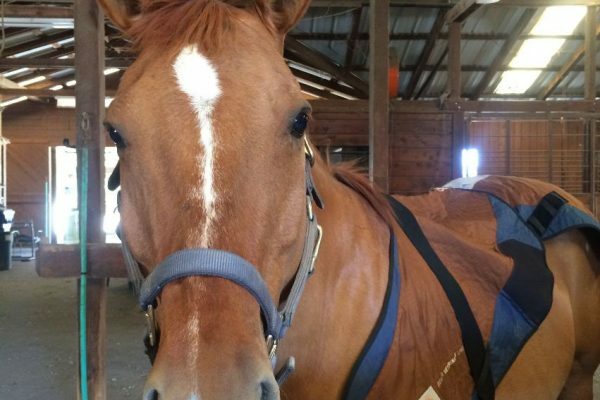 After a year of successful fostering, the horse is then available for adoption by the foster family. 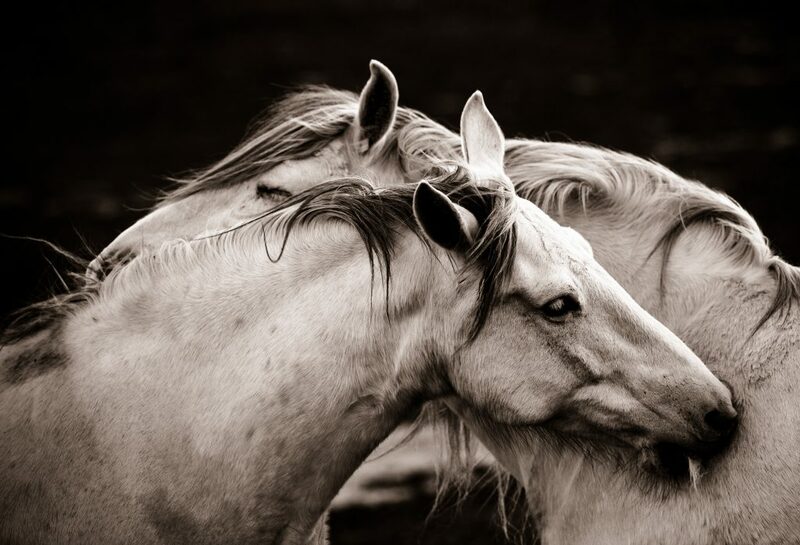 Those horses who are not adoptable due to age, illness or injury have a permanent home at the sanctuary,” explains Sara Ruggerone, Equine Care Supervisor. The Redwings Farm-to-Table Event on September 29, 2018 from 11:00 am – 1:00 pm is open to anyone who loves and appreciates horses – or for those who enjoy supporting a good cause while enjoying good food! 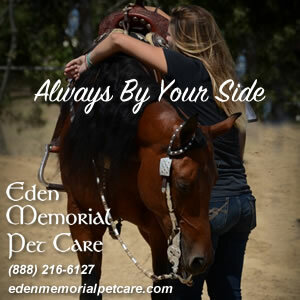 If you would like to learn more about equines or rescuing equines, you will enjoy speaking with the Redwings Horse Sanctuary staff. 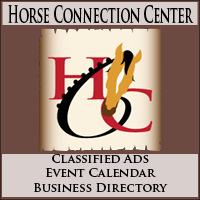 Tickets for the event are $75. Guests can also reserve a customized gourmet basket for $50, which includes locally-sourced olive oil, hand-milled soap, organic herbs, farm-to-table produce and baked goods to take home. If you are not able to make it to the event gift baskets can still be ordered and delivery arrangements will be made. 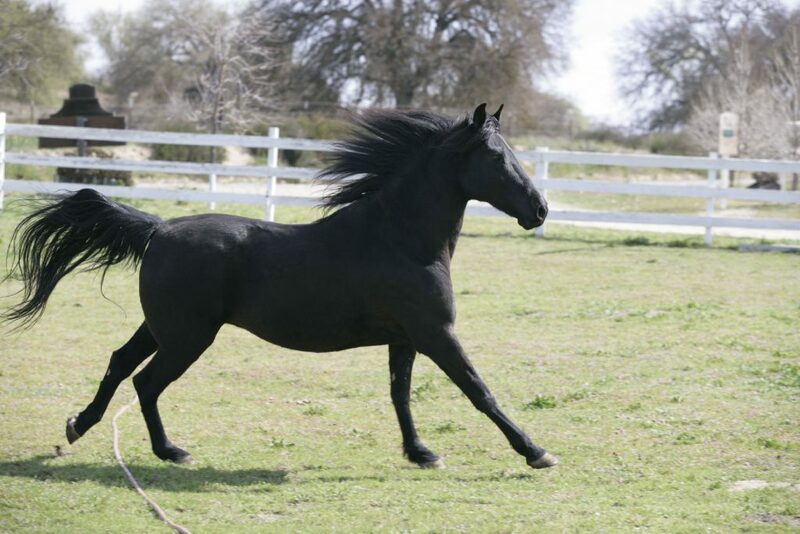 Proceeds will help support the on-going efforts of Redwings Horse Sanctuary. Please contact Desirae (contact info below) to order your customized gift basket. 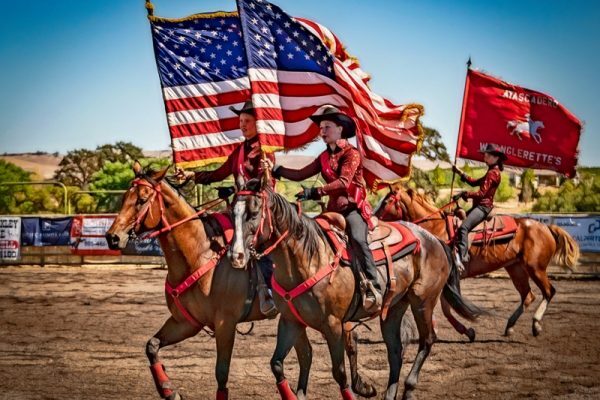 Guests will be asked to arrive at the Markham Ranch Clubhouse, 13900 Castlerock Ranch Road, Salinas, CA 93908, where they will park and meet our event attendants. A gate code and directions will be provided with RSVP. 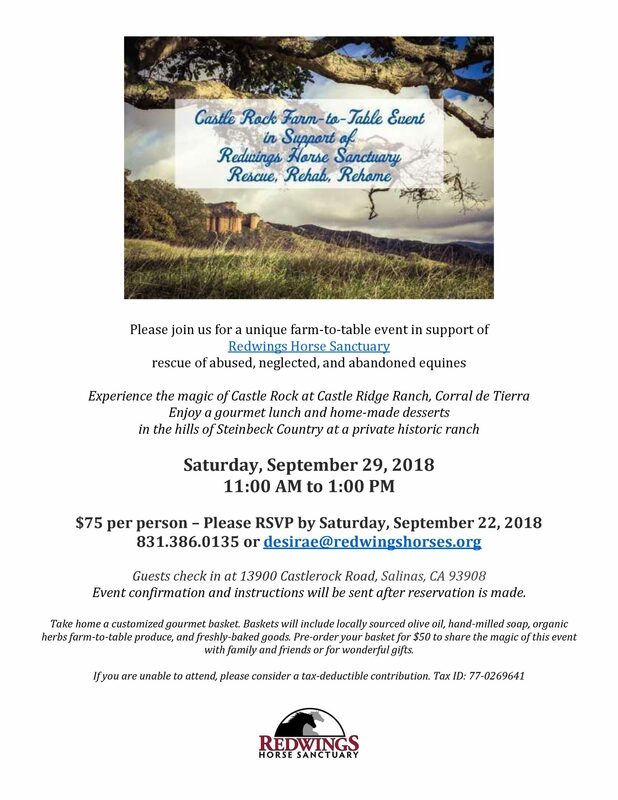 Please RSVP, or order your gift basket in support, to Desirae at the Redwings front office: desirae@redwingshorses.org or 831-386-0135 by Saturday, September 22, 2018.